After you've set up your Facebook app, you may decide that you want to gather extended permissions from your members. For example, you might want to access a list of videos your member has watched or rated. Many permissions are not included in Facebook apps by default. To get them, Facebook requires you to fill in some additional documentation and submit it to them. 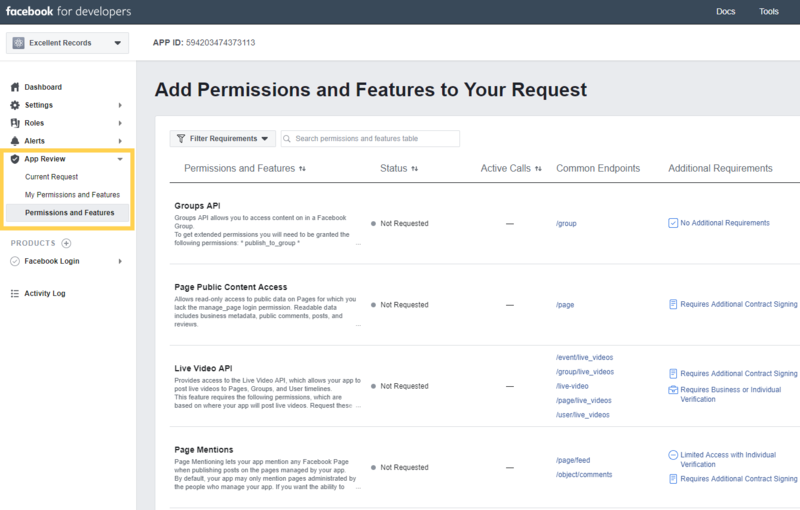 This article goes through the process of getting extended Facebook app permissions, step by step. We recommend that you set aside a couple of hours if you are doing this for the first time and you want a lot of permissions. Select your app in the Facebook developer dashboard, then click on App Review, followed by Permissions and Features (found in the left sidebar). Click the "Request " button for the permissions you want. user_likes: This permission allows you to see what a member has liked on Facebook. user_posts: This permission allows you see the content of your members' posts, as well as when their friends tag them. user_birthday: This permission allows you see their birthday. This may not include their birth year, depending on their privacy settings. user_location: This permission allows you to see a member's current city. user_gender: This permission allows you to see a member's gender. Of course, you can choose any extra permission you'd like. Note that you need to be able to justify each permission you require in your documentation for Facebook. Our advice is to ask for what you really need, not what you think you might want in the future. When you're done, click "Continue." Next, you will see a page that lists all the permissions you've selected. Click on one of these permissions to add an explanation for why you require the additional information. You need to explain how the information you're requesting from Facebook will be used for the customer. Describe in detail how AE creates personalized experiences for your customers, whether that is on-site or in an email. You will need to write out step-by-step instructions on how your member logs into your website. We suggest writing out the steps and talking about how the "user posts" or the "user likes" are used to create personalized content on login. You just need to guide Facebook through the process and how you intend to personalize content for your customers. Do this for each platform you require: Web, iOS, Android, etc. Facebook requires a screencast to complete this section. You can take a screencast of your live website. Like the step-by-step instructions you wrote out, show how a member logs in with Facebook. Then, show the Facebook permissions pop-up window. To the best of your ability, show how the website experience will offer personalized content to your members. Don't worry about making it perfect. The team at Facebook just want to see what your site looks like and how their login is being implemented. Once you've created a video file, click "Choose a file to upload" and select your file. Once the form has been filled in and your screencast has finished uploading, you can safely press the "Save" button at the bottom of the form. Each permission you have asked for requires its own note. You will need to fill in a form and add a screencast for each of these permissions. Note that you can usually copy and paste your step-by-step instructions and make some tweaks. And, depending on your website, you may be able to reuse your screencast for all of the permissions. When you've finished adding all of the required notes, you are ready to submit. Once you have checked all of your notes for accuracy, you can press the "Submit For Review" button down at the bottom of the page. Keep riding that wave and set up AE Connect on your website.